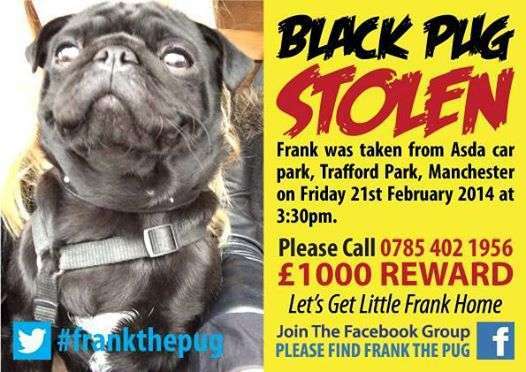 In 2014 Phil Ludlam's pug, Frank, was stolen. After 18 days the pair were reunited, but their story isn't the norm sadly. The experience changed Phil's life and he wants to help more dog owners who have been affected strengthen their change to get their dog back. Based on his experiences, here are some of his top tips for getting your stolen dog back. The first thing I would suggest is to contact the police and report your dog as missing. In my case, it was obvious that Frank had been stolen so call the police and report the theft. Be persistent with the police that this is a crime to be taken seriously. Then, notify your local dog wardens, call local rescues and shelters and give them as much detail as possible. Email photos if you can and ask to be put on their 'missing dog' list. Also, contact your dog's microchip register and report your dog as stolen/missing also. The faster you act, the better chance you will have to get your dog back so start searching the area. Call friends and family for help. The more people who can search, the better. Approach people, look for witnesses and ask if they saw or heard anything. If your dog has been stolen from outside a shop, for example, ask the local shopkeepers to check CCTV footage. This can then be shared with the police. Visual aids like posters and leaflets are vital because obviously having something with your pet’s photo on will help to show people what your pet looks like and puts a face to the name, and theft. I would advise getting something done professionally and then get as many as you can printed so you can give them out, put them on noticeboards, lamp posts and so on - wherever you can think off! Get your pet out there! I went to Manchester Airport to hand my posters out, for example. Some pet insurers have a policy which covers pet theft, if your dog is insured, check if this is the case for you. They might be able to help your campaign to raise awareness and cover the cost of materials designed and printed if so. Before Frank was stolen,I hardly ever used a computer. Using google and checking my emails was about my limit. I didn’t have any social media profiles, I’d never used Facebook or Twitter, in fact, I wasn’t even sure what they were! But it quickly became apparent just how important social media would be in helping me to find Frank. Friends and family rallied around and helped spread the word and it was amazing what happened. Thousands of people shared our poster to spread the word. It was the quickest way we could have reached the masses to turn up the heat. My plan really from the beginning was to make Frank too hot to handle and all of the above helped to do this. As a pedigree dog, I didn't know if this contributed to the theft and reason he'd been stolen, or what the reason was from the outset, but I knew Pugs and pedigree dogs were very often targeted. Regardless, I wanted to make him too hot to handle. Phil has also designed the FranKage which he is looking to encourage supermarkets to take up as a safe and secure way to allow dog owners to bring their dogs to the store, knowing their dogs are safe outside. You can find out more about it here. My American pit name DD short for Deamon Drop was stolen from her chain in my yard a couple of days ago. She is only about 7 months old. We have found her and the man isn’t wanting to give her back. I don’t want any trouble with him. I’m afraid of what he would do if I called the Sheriff to help me. What other means can I take on getting DD back? I am 52 and she is going to be my service companion.